The Shortstop is half, along with the second baseman who makes the whole, which make up the core of the defense up the middle, which historically a baseball team weak up the middle is hard pressed to win a championship. These two infielders must be so familiar and trusting, which only develops through practice and experience, in being able to anticipate what one another will do in any specific situation, that he will automatically throw the ball to second base without waiting to see if the other player is actually physically there covering the base. 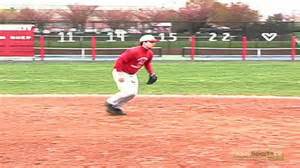 This trust is imperative to prevent any type of hesitation on the part of either player, because hesitation is a Double Play Killer as the middle infield positions are no place to have memory lapses or indecision. Covering Second On a Steal? 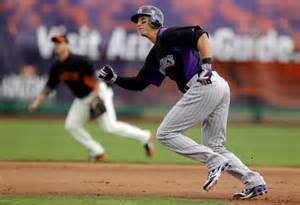 Let’s learn firsthand what and why the shortstop reacts to certain game situations. Situation one: A runner on First Base and the batter squares around to put down a sacrifice, or surprise bunt, the shortstop is responsible to immediately cover second base, in order to receive a throw from the fielding player, who is attempting to get the lead runner out by a force out. Obviously, always face the players who are fielding the ball, foot against the edge of the base and offer a target. The infielder will not intentionally throw to the target, but having a target presented helps eliminate any subconscious doubt of nobody covering the base, which will create hesitation. Situation Two: A runner on Second Base, same scenario as above, the batter squares to bunt in order to move the runner over or bunts for a base hit, does not matter. The shortstop is responsible for immediately covering third base, as the base will be vacated by the third baseman, who should be charging the bunted ball, and should the catcher be able to field the ball, he’ll want to throw to third in order to force or tag out the lead runner. In the tag out situation of bunting the runner over, always straddle the foul territory side of the base and offer a low target on the infield side of the base, allowing the runner to slide into the tag. 1. The ball begins to float or be wind driven towards the right side of the infield, the second or first baseman should make the catch. 2. Although the ball will land at the shortstop position, the shortstop is staring into a glaring sun, making the catch difficult. Either the third or second baseman should make the catch as they have a better angle at the ball not looking directly into the glare. (1.) 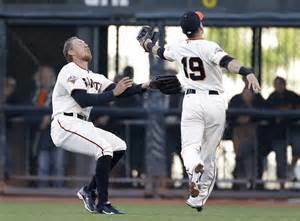 Although the shortstop may not ultimately catch the fly ball, someone must have the initial responsibility of catching the ball so everyone doesn’t expect the other to make the catch and the ball falls for a hit. Situation Four: The shortstop should always attempt to catch any pop fly into the short outfield, either center or left field. He should never assume an outfielder will be able to reach the ball, however should an outfielder call him off the ball, he is to immediately stop or peel off allowing the outfielder, who has an easier play, to catch the ball. Remember, it’s always easier to catch a ball coming in on it than going out. Situation Five: Who covers second base on a steal attempt? (a.) In the younger age brackets, the second baseman would normally cover second base on a steal attempt because he covers when a right handed hitter is at the plate, which is the majority of the time, but the shortstop is responsible if there’s a left handed batter up. The two must communicate who will cover or run the risk of nobody covering, or both covering leaving the entire middle of the infield unprotected. (b.) However, in the older divisions the mix changes drastically, which requires communication. The batter may be a strict pull hitter, or the catcher may be calling pitches away from the hitter, or a lot of breaking balls. These variables all add to who will cover the base for a steal attempt and the duty must be assigned.